Save The Bookstore. Save The World. 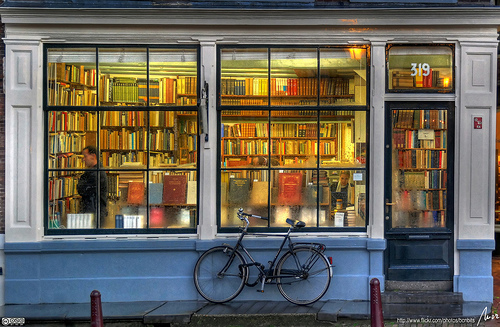 Unlike climate change, where the impact is still widely invisible (that is if you disregard the biting cold that has plagued us these last few weeks) – the disappearance of the bookstore is a phenomenon largely visible. Walking the high street in recent years and you’d often be confronted with a closing down sale sign in front of the likes of Borders, Barnes and Noble, Waterstones, et al. A sight that greatly saddened me. The beloved bookstore! How could its popularity possibly be waning? With the glorious tangibility of hundreds of shelves stacked with stories and possibility and knowledge, waiting for potential perusal. As they currently stand, or perhaps fall, the bookstore is a relic. They possess nostalgic charm rather than a real sense of purpose or relevance in today’s society. The weight, cost and burden of actual books becomes more and more unreasonable, as our digitalised and mobile society continues to grow. I still like the idea of having a bookshelf and being able to capture and present your reading tastes, however, besides aesthetic reasons, the book is easily usurped by the practicality of the e-book. Publishers are increasingly aware of this and look to promote their e-books across various social media platforms, equally, if not more so than books themselves. And so booksellers and shops, must too convert to this perspective. E-books should be made available in shops or perhaps like the Apple stores have devices that enable you to browse what’s in store digitally. There needs to be enticement or encouragement for people to visit bookstores as well, the desire to buy books isn’t enough, as online giant Amazon and websites for bookshops themselves corner the market. People have access to books in a plethora of ways that practically negates the bookstore. Forbes recently featured an article about a man who embraced the digitisation of content by investing in The Espresso Book Machine, “a compact digital press…[that]can be also used for custom publishing, a growing source of revenue, and customers can order books in the store and on-line” to rival Amazon. Owners have to seek out creative ways to engage their buyers. Events or fairs held at bookstores, authors giving talks, even acoustic gigs – anything, whether literary related or not, that draws them into the venue and thus optimises the chances of a purchase. I was in a Barnes and Nobles in New York recently, and as well as all the fiction best-sellers, autobiographies and cookbooks they had a whole warehouse round the back, stocked full with old textbooks, second-hand novels and non-fiction finds, as well as rare or 1st edition prints. It was an emporium of bookish delight. Whilst this may only appeal to real book lovers, it added another element to the stale surface of the book store and another 40 minutes to my visit to the store. Other ideas thrown around that you’ll quickly discover if you browse the internet, may also serve to brighten up the bookstore and once again make it a place really worth visiting. A concept known as product bundling, which may be familiar to economic students, has long been in practice in cinema chains, wherein exhibitors purchase a bundle of films off the distributors. More often than not this includes the latest Tom Cruise blockbuster, with a few lesser known or independent films. This marketing strategy could also incorporate books, and sometimes already does with 3 for 2 offers. The aim would be to get unknown or undiscovered books off the shelves along with the bestsellers. Or perhaps with an actual book, you get a digital version of another alongside it. It’s not about devaluing the book or suggesting the only way for it to be sold is if it sells its soul to the digital devil, but simply compromising to meet the demands of the readers. Of course, discounts and sales always to help to catch the eye of the consumers, but book stores should also be filled with specialist knowledge and people that really know their stock. That way if you have question or need a really obscure title, you’re more likely to revisit the store, because the staff were able to help you find it. The economic market doesn’t help, what with shop rental prices sky-rocketing. However, I strongly disagree that bookstores should be relegated to a thing of the past. I consider it an imperative to strive to maintain these cultural emporiums, before internet kills the book store, as video did the radio star. I don’t suggest we cling onto their current forms, but instead mould and tailor them to new demands. Adaptation is after all the best form of survival. Love this and I couldn’t agree more. Thanks for sharing. If you’re ever in need of some great book reviews and musings, be sure to follow! Thanks!! !